Geshe Kunga is the previous resident teacher of Ganden Yiga Chozin Center. 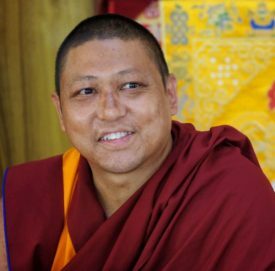 Geshe Kunga joined Kopan Monastery 1990 and received his Geshe degree from Sera Monastery in 2017. He was appointed by Lama Zopa Rinpoche in June 2018 to teach at the center and coordinator a new project comprising a large stupa and statue near Pokhara. Geshe Kunga is on leave to complete his studies at the tantric college.